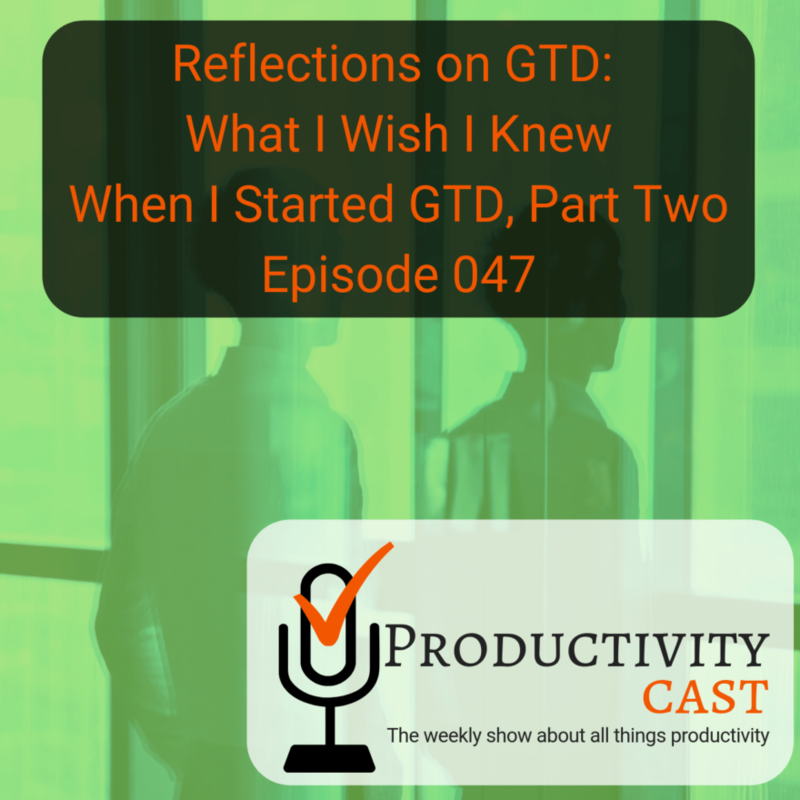 This is episode nine, Reflections on GTD: What I Wish I Knew When I Started GTD, Part Two, and therefore the last in our nine-part series on the Getting Things Done (GTD) personal productivity methodology and eponymously-titled book, from the perspective of the ProductivityCast team–as long-term practitioners, critics and observers of GTD. In this cast, Augusto Pinaud, Francis Wade, Art Gelwicks and I discuss what we wish we knew when we first started or came across Getting Things Done, the book and methodology, as we tried to understand and/or implement it. This certainly isn’t the last time we’ll talk about GTD, but we had a great time discussing GTD in this series and hope you enjoyed it, too! Are you ready to manage your work and personal world better to live a fulfilling, productive life? Then you’ve come to the right place productivity cast the weekly show about all things productivity here, your host Ray Sidney-Smith and Augusto Pinaud with Francis Wade and Art Gelwicks. Welcome back everybody to productivity cast the weekly show about all things productivity I’m recently Smith I’m joined here with August to pronounce Francis weight in our galaxy. Welcome to the show gentlemen. it’s good to have all of us on the show again this week and and we’re back at it with a continuation of the conversation we were having last week. And to fill you all in. If you haven’t listened to Episode 46, hop on back over there and listen to Episode 46 at productivity cast.net forward slash 046. And you’ll be able to hear the first part of our conversation about what we all wish we knew. When we started GTD, some of us are not GTD practitioners now, but we’ve all been acquainted with the material and have probably attempted to implement it at some level. And these are all things that we wish we had known when we first attempted to go ahead and implement. So I’m going to kick us off here with the first item that I really am thinking about as we continue the conversation from last week. Which is this idea of, of trusting your system. And so David Allen talks about trusting the your system. And and through this concept of trust, you’ll be you’ll be more comfortable with externalising your tasks and projects. And I’m very curious about what you will also have to say about this. Because when I first thought about that, it was a real game changer. For me. I felt very excited about this idea that if I trusted where I was good to put things, then then I was going to I was going to be able to know where I put things. And what I learned was that trusting your system isn’t merely externalising those tasks and projects it really does fundamentally require you to go back to your projects, lists and your task list and work those lists. Right. If you’re not maintaining them, then you very quickly erode the system. It’s not just trusting your system from the fact that you’re trusting yet you’re capturing into it, you must remember that you’re not just capturing. But you have to also be clarifying. You must also be organizing, you have to also be reviewing and doing the work. If you’re not doing each of those stages, then the system can’t be trusted. The tools that you’re capturing into won’t be trusted, because you’re not coming back to your your brain basically says, Well, yes, you’re putting these things in the system. And they’re not getting done. Why should I trust where you’re capturing externally, I’ve got to bring all of that stuff and back into my, into my mind’s eye in order to be able to keep keep going. Because you’re not, you’re not actually getting those things done. CABI put it into your arm doesn’t matter. If you don’t trust that that system is complete and functional, you are not going to do the necessary job to maintain it. So it stays functional. And what the sad part is, your system goes from fully update fully functional to broken in really the blink of an eye. I think we’ve talked about the organic effect for for our listeners who might not remember or didn’t catch that episode. It’s the subconscious way of remaining, or pinging or conscious mind that there’s something it’s it’s not, it’s likely to forget, or likely to not remember, or, or is part of the system that’s not trusted. So the idea is simple as that when you complete a task, the task disappears from memory, and your subconscious mind no longer holds on to it. But when a task is left incomplete, it keeps sort of sending the signals to your conscious mind. And if anyone has ever woken up in the middle of the night with justice, you know, in a panic that I forgot to do something, and that I remember to send that email to Mr. Smith that I was supposed to send yesterday at the beat the deadline and, and I think I forgot, and that’s all those, the garlic effect. And what it does over time is that it It destroys our peace of mind, because it leads to a feeling of overwhelm, as our subconscious mind goes into overdrive and tries to hold on to all these demands on our time. All these promises and commitments that we’ve made, the good part is that there’s recent research from a couple of guys that you University of Florida, which showed that if you have a trust, essentially, is to put it in the language that we’re talking about today, if you put your tasks in a trusted system, then the guy Nick effect goes away. That’s that was their big fanning. So essentially, it matches what David Allen was saying, in principle is that his he was right and dead on by saying that as as if you can deploy as many tasks as possible to your trusted system and not use memory, you will be doing yourself a great service and avoiding any sense of overwhelm the problem this is a Google said, which can happen in the flesh of an eye. And this is sort of weird David Allen goes a little too far my man is that if you have a huge influx of tasks, new project new baby just bought, the hose car broke down, all of a sudden, you have a lot of tasks demand is and therefore very little free time to manage them with is that you go back to almost as if you are just starting all over again, because of the guy Nick effect kicks right back in just as if you are a beginner who doesn’t even have a task list. the the bad stress part is deal under the gun, a conflict that there are only about the the tasks that are that you can’t be trusted to do. So they’re, they’re either not in your trusted system or your system is totally trustworthy. So we’re, it believes that there’s a gap in capability is where the, it’s not just a dog in the central a gentle reminder, this is a wake up in the middle of the night, kind of five alarm kind of overwhelming feeling, you know, heart racing palms sweaty for it’s the it’s not the total number of tasks that you are trying to manage, or even the circumstance, it’s whether or not your subconscious believes that some of those tasks are not, you can’t be trusted to manage some of those tasks. In other words, the ones that you’re likely to fall through the cracks. So it’s not, you could have a million tasks. But if there’s one that it doesn’t believe that you’ve captured, it will wake up in the middle of the night. That’s not the volume. It’s the it’s the existence of the ones that it can’t trust you to manage on your own. Okay. And I think you’re hitting the the key point of this. And this is where I get, I’ve been getting a little stuck on this whole trusted system, which is something I jump up and down about all the time. But remember, a system is only good as good as the person executing it. And if you can’t trust yourself to execute within the parameters of your system, you can’t blame the system for failing you. So things like, you know, when we talk about this organic effect. And we talked about keeping open loops in your head, you’re failing your system, it’s not your systems responsibility to get those things out of there, it’s you to utilize that system. So you have to, you have to have confidence in your ability to stick with what you’ve created as a Philadelphia sports fan. There’s this thing with the basketball team called trust the process where for years, a couple years, we just totally tanked the team and then rebuild to try and make a championship level team. We got close to here, but not quite. But it’s trusting the mechanism. It’s not the process that fails, it’s the people executing the process. So when you look at your solution, if you’re looking at GTD, if you’re looking at bullet journaling, or whatever, you have to take a step back and say, Can I trust myself to actually execute this consistently correctly. And in a way that’s going to work for me, if you can’t say that with 100% confidence, or even 99% confidence, you’re just setting yourself up for problems. the problem was, what you described, and I like you seen it a million times is be people assume that because they did a good collection and they got Inbox Zero, okay, I’d before the weekend review and they did proper processing, then they don’t need to touch that until next week. And the reality is they every time you get it not every time you get input, it’s necessarily to recalibrate, and reprocess and reorganize. But a lot of times is on a lot of more often than what people does, you know, a lot of people go and look into, oh, well, but I did, you know, organize and process everything last Friday, yes. But if you have a significant amount of inputs, then you need to do it that day. And sometimes you need to do that three or four times a day, especially, you are in a high input world. And that it’s one thing that again, I could have missed when I read the book, okay. But the impression on the book is all you’re going to do this magic collection process. And then you’re going to do this magic organization process and life will be good. And you have you know, General need, you need to think David on is famous for the sentence. I only think once a week, I’m great for him. I wish I could tell the same. But the reality is, every time I get important inputs on my system. And the problem is, I never know when input comes, who’s going to be important or not, in most cases, okay, that require again, to think about it organized about it, process organization. So you can do and what the book tells you and push it through is just need to do this process once a week. Well, no wonder you break it, there is no way you can leave hi input level, especially at this speed. Most people I see is getting input in a once a week situation or processing situation. I really do wish that there was a more exhaustive list of context, so that there so that people could see that there was a greater variety when it comes to context. For me, I, I really do feel the sense that people come to GTD not understanding how their work styles and their workflows work for them. And so then their contexts become difficult to identify, because they don’t know how they work. And that is they don’t know, they don’t know how they work, not how contexts work. They don’t know how the individual person works. And so you need to really do some background work in understanding how you take your typical projects from start to fruition. And then you’ll understand whether or not you need particular types of contexts. So just looking at the the type of work that you do, and then does that efficiency because contexts are about efficiency, right? It’s about grouping like things together to some great extent. So that when you have those resources available to you, whether that be, you know, you’re sitting at your work computer, or you’re sitting at your home computer, those those resources, those faculties are available to you at those times, that you’re able to do those things together. And for for someone like me, I don’t work that way, right, I work in a very project perspective, in a very linear fashion, I don’t work in the typical efficiency of I’m going to make all my phone calls now, because I have my phone. But the reality is, is that I like having access to that list of all the phone calls I need to make in any given day or week, so that I’m able to say, Okay, well, I know when I can make that phone call, and I know what I can make the few phone calls together in that period of time. So I really think it’s a matter of just figuring out if you’re comfortable with the level of administration necessary to create the context, you know, the taxonomy that allows you to then look at a calls list, right? For me, that just means tagging actions, you know, as calls in my task manager, it’s not, it’s not an exorbitant amount of additional detail. But I don’t use that context very often. Because if I’m doing a project, that means yes, I’m going to I’m going to move from maybe sending an email, to making a phone call, to writing a document, to back to making a phone call to logging into a system and updating a system and then coming back to it, and so on, so forth. And that’s going to be the the chain of tasks that I’m doing one after the other, that’s okay, for me, because that’s making progress that’s productive. And making all the phone calls that are on my list all at one time, is not necessarily the most productive use of my time, because I don’t see the the forward progress on a specific project, which if I just did that did the series of four or five tasks to complete it, then it would just be done. And then I wouldn’t have to go back and do more administration. So that that I really wish I understood at the very early stages of GTD, I learned that and since I have learned that about myself, it has been much easier to manage the system, you know, re crafting it in a project based perspective, with the with the ability to look at contexts when necessary. Yeah, I have to go along with that. Because to me, one of the things I wish I had thought about early on was the difference between completion and impact. For example, if you look at GTD and you think about context, such as, you know, their original ones, like phone, computer, and things like that, all of those tasks, for all intents and purposes, are considered equal on impact to the overall execution of what you’re doing when they’re applicable to a given context. So if, let’s say, phone calls, so if you go through and you make 10 phone calls, they’re all equal, but they don’t necessarily when you think about your projects, impact those projects. Equally, one may be just a return phone call, one may be a courtesy call one maybe a follow up to get a payment on an invoice. Those are not equal for impact. But yet, there’s no I wouldn’t qualify that as priority, I wouldn’t qualify that as a particular context for them. It’s it’s an aspect that is left out of the entire system, when it comes to truly evaluating the quality. And like I said, the impact of the work that you’re doing, it’s very easy to go through and say, Hey, I did that on that project. And I’ve checked off that box when you realize, if you really navel gaze a little bit, that checking off that box is just making you feel better, it’s not actually moving that project any significant distance forward. I’ll jump in on that I caught myself doing that actually, relatively recently, within about the past year. And it was a culprit of gamification. As I’ve mentioned, to the past, I used to do for my to do tracking, just because I love the tool and the multiple platforms and things like that. But it has the ability to do what’s called a karma score, which keeps track of your successful completions versus your overdue items to give you a running idea that you’re continuing to make progress. However, it’s very easy to gain the system. If you have lots of small recurring tasks that you’re knocking out every day, you see a lot of checkboxes being checked. But the there’s no connection of those to the value of those items being done. I had to actually change how I think about my system and how I’m looking at it to make a value out of that kind of a measure structure. So even though I saw my sketch or my score continuing to go up, it wasn’t I didn’t really feel that, well, it’s going up. But is it really doing anything I mean, it’s like eating cotton candy. It’s nice, but it’s not doing anything. after that allows for ownership, I think and buy in, because if you’re just taking some pre packaged set of contexts, or say tags, and in that sense, then you don’t really get the fact you don’t, you don’t get the the sense that you are in control. And that locus of control over your own system is so important. And there there’s a, there’s a piece there that I that I think about, which is if if you if you if you don’t understand how, as you said, adding attributes to it to a task or project helps you understand things, I’ll give kind of a little bit of a mini explanation, which is that you need to be able to group things together, right? So there’s a question have a taxonomic will approach. And there’s an ontological approach, how do disparate things connect to one another, and that is really related to potentially phases of things, right? So moving a project from one thing to the next, you know, what stage that project is in, or that from one task to another way, what step that is along the path line, you are able to do that, so you’re able to group things so that you can, you can filter things out of view, right, create focus. And then the other side is that you could find things when you need to find them, because you want to say, Okay, well, I only want to see my, the things that I can do at home. That’s a filtering process so that you can, you can see only those things. But the other side to that as well, I only want to see things that I can do right now that have high energy. So I want everything that could potentially be low energy stuff to go away right now, I want to be able to bring those things to the surface. And I that’s a subtle differentiate, you may even see them as the same thing. But the point is, is that we want to be able to find something at some particular point in time, what’s that thing I need to do at that time, oh, look on my calendar, I find that thing the attribute is, of course time. The other side to that is I only want to focus on these types of things right now, or this type of thing right now. And so I want to make everything else go away from that. And so finding and contextualize in your resources is really important there. And if you can understand that, then contexts become much more useful. Now, let me show up in here for a second because I want to be clear to anybody who’s listening to this, that we’re not dismissing context, especially we’re not to desist dismissing the structure. And the idea of context, as it was outlined in GTD, there’s a great way to apply this, I’ll use the analogy of how my lovely wife and I decided to go out to dinner. It’s the classic model. She’s not sure what she wants, but she has a really good idea of what she doesn’t want. So we go through the drill of I say, hey, do you want to go out to dinner? Sure. Like, where do you want to go? I’m not sure you want Chinese? Now, I don’t want Chinese Do you want pizza? No, I don’t want pizza. And we go through that back and forth, back and forth. Until finally I say, look, I have no idea what you want. So if you think about that with context, and you look at something like GTD, and you look at their examples of context, you don’t have to say, yes, those are the ones I want, look at them for the ones you don’t want, look for the ones that aren’t applicable, and take those out, use it as a starting place. Because I think the four of us, when we look at this kind of a structure, we’re looking at it from a long time of analyzing these types of systems. And it’s easy for us to start with a clean palette, you know, a clean slate of potential category of context, just start blowing and create them on the fly based on relative context. Well, for somebody who’s new to this, that’s not going to be easy, they don’t, there’s no starting place. So use it as that list and strike things out and allow those to spur what the potential context could be that are relevant to you. agree with you, if I were a road warrior? No, my email will be on my phone. The problem is, I’m not a road warrior anymore. When I was a road warrior many years ago with get email on you’re not, I’m choking before, you know, their blackberries came into work. Okay, I figured it out how to connect my Palm Pilot so I could get an email on the go. Because that was and I understand that involve a lot of weakness on the process. I get it. It’s a lot more simpler today. But it but that’s, you know, with anything in the productivity, you need to understand what is your reality, your reality is, you are a road warrior, this then jets, if you go from home to their office on one or two meetings, most likely, you can survive fine without checking your email on your phone, and then do it on the device where you are going to really do something about it. I think I mentioned in the last last episode that I had to recover mess of from GTD in a way because I was using another system I thought there was something wrong with it. That picked up GTD thinking it was a solution, tried it for long enough to realize it, it made things worse in my situation, and went back to the old system that I was using, I modified it from there. And it’s not a problem of the old system, or of GTD, it’s exactly what you said is that I didn’t know how to customize my habits, practices, the apps I was using, I didn’t know how to customize that ecosystem. And even know that I could really and I needed to be really sensitive to what was happening in my life and make changes accordingly. I wish when I had ready to do it, I just said that in the beginning of well, say, Listen, this is a set of static patterns set of of very useful behaviors and thinking however, you the bigger picture is that this won’t last you for the rest of your career, or the rest of your life. Or for time immemorial, there will be a time when this tool becomes obsolete. And there will be a time when maybe before that when you will outgrow it that you need something different. So the bigger picture is that you this is a potential stop on the way to your final destination. But it’s not the final destination. And as you read each chapter, think of it as a possible solution. But the bigger picture is that you’re teaching yourself how to make a change from wherever you are, know, to wherever you want to be. And this is just one stop on the way if that message were there, I would have cleared up a whole lot of confusion for me. Yeah, when I think about these types of systems. Now, GTD not just exclusive to this, we have to think about it in the context of like car navigation systems and things like ways if you have a system, you’ve planned out a path, and that path is not adaptable to changing conditions, the odds are pretty good, you’re going to have a problem at some point, you have to decide that they’re going to be times that your system is going to come back and say recalculating. And if it doesn’t, you’re going to get lost. But if you’re you are introducing the opportunities to look for a better path. Look for a shorter route, look for a way around a traffic jam that has introduced itself into your career in your life. Your system can then help you through that what you should be looking at. We talked about the trusted system, it’s not so much a trust on will the system work for you? But is your system a trusted partner in your daily life? Is it going to help you through the times when you can’t help yourself? That’s a lot to ask. But it’s in my mind, it’s the goal that you want to strive for. Well, said art. And I think that’s a really great point for us to close out this episode of productivity cast. So to our our listeners, do you have a question or comment about this cast or something we discussed, if you’re listening from anywhere other than the podcast website, you can go ahead over to it at productivity cast.net forward slash 047, which is the episode number and they’re on the page as a comment section at the bottom, you can feel free to leave a comment or question there. You can also go to forward slash contact and shoot us a message and we’ll be happy to answer questions there on productivity cast.net forward slash 047, there are the show notes. So any of the tools or articles we talked about, and so on, so forth are there links to them are provided there. So if you’re, you’re really sitting in one of the apps and you see the list of the show notes, but they’re not clickable, just head over to productivity cast.net and you will find the clickable links to those things thanks to a goose, Joe Francis and art for joining me here on this cast. And if you are listening in iTunes or Stitcher, Google Play Music or whatever, feel free to leave a rating and review that really helps us grow our personal productivity community. And we all appreciate the kudos. So thank you. That closes out this episode of productivity. Cast the weekly show about all things productivity, here’s your productive life. And that’s it for this ProductivityCast. The weekly show about all things productivity, with your hosts Ray Sidney-Smith and Augusto PInaud with Francis Wade and Art Gelwicks. Download a PDF of the raw, text transcript of the interview here. Note: GTD® and Getting Things Done® are registered trademarks of the David Allen Company. This is not affiliated with or officially endorsed by the David Allen Company.